Help Me Find My Lost Pet! Holidays, vacations, and any change in routine are typically stressful times for most of us, and seriously stresses out your animals. But, they don’t have to be if you know what to do to minimize the stress. Taking the right steps to de-stress your animal helps you de-stress too, because it helps you plan in ways that are more manageable, creates more certainty, and helps you be less emotionally imbalanced. Remember that your animal mirrors you so if you’re stressed, frustrated, anxious, nervous or worried in any way, that’s the message they get and that’s what they’ll act out (mirror back) for you. Instability is not your animal’s friend! Your job is to make their environment as stable and calming as possible, and to prepare them properly in advance for changes in routine. Monitor them carefully during the events. That doesn’t mean that they can’t experience change in routine or be completely protected from anything new or different. And, they need a way to tell you what they want and if they have questions or concerns. So you can see how important it is to help your animals de-stress through the holidays when going on vacations, moving or when you go on trips together. 1.Excessive panting or heavy breathing. This can also look like running around uncontrollably, being restless, hyperactive, bouncing off the walls and acting unpredictably Pay attention to the signs and don’t ignore them! They aren’t happy they are stressed and need your help.Be consciously aware and calmly and confidently create a time out where they can calm down, then leave them alone. 2.Holding their breath and being rigid, tense, a worried expression, or they go into a hiding mode.If that’s the case, then give them a safe zone.That could be their kennel, or simply shut them into a room where they can calm down on their own. They have become hyper-stimulated and need a chance for their sympathetic nervous system to reboot. Some animals are easily over stimulated, so notice where their tolerance levels are and try not to exceed that. 3.Acting out with really bad behavior. Usually when they get to this stress clue, they’ve already blown through Stress Clue 1 and 2, and are over the top before you’ve noticed or paid attention and taken appropriate action. What you can do about it at this point is simply remove them from the area and take them back to their safe, quiet zone. What can you do if you see any of these Stress Signs? 1. Keep their routine stable in as many ways as you can.Feeding routines should be at the same time of day with their same foods, keep to their same sleep schedule, if they’re being boarded take their favorite toys or treats and be sure they have things of their own with yours and their scents on them (scent is critically important to animals). 2. Discharge energy they need exercise! If they start getting fussy, irritable, depressed or start acting out, they need play therapy (for cats) or a great walk or run for the dogs. Exercise, discipline (rules, limitations, boundaries include and continue training and reward for good behavior keeps their world more stable) and then affection, in that order. 3. No look – No touch – No eye contact until they calm down and are ready to connect calmly with others on your terms. For animals that get too excited or over stimulated, practice (and tell your guests or other people you’re in contact with) to ignore them until they settle down. 4. Be calm, confident and assertive no matter what happens. If they are acting out with bad behavior, don’t yell, don’t call their name and don’t chase them.Use your correcting voice and your body language to distract or redirect them until you can better control them. Then simply remove them from the area until they’ve calmed down, and you can have your chat together. 5. Tell them what you want them to do! They need a job and they need to know what’s expected of them, and how you want them to behave. So tell them! First, after they’ve calmed down and can listen to you again, talk to them about their behavior. Image what they did that was bad and feel how upset that made you. Then, feeling your emotions about what happened. Doing this properly is critical because they can feel them too. Emotions let your animal know why it is important to you. Next, image what the consequence of their bad behavior is or could have been, showing them the worst case scenario. That helps them put the story into context so it makes more sense. Finally, tell them the story about what you wanted them to do in that situation, how you would feel if they did that, and how happy that would make you feel. This way you address the bad behavior, but you also offer the positive suggestion for what you really want to have happen. Want more? 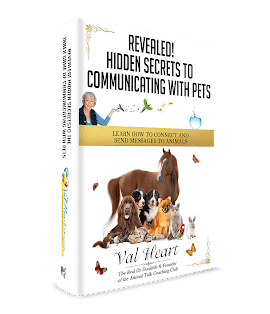 There are 3 simple steps to communicating in my free Quickstart to Animal Communication home study course. And the world’s first Animal Communication Made Easy System and Virtual Retreat takes you much deeper into heart centered connection and understanding. Your cat, your dog, your horse or your bird depends on you to care for them. And a big part of your doing that successfully is in knowing how to understand them and communicate with them on a daily basis. Plus, communicating with your animals is really fun, too. When properly prepared, they can give you all kinds of feedback about your family and friends, alert you to any potential trouble brewing, and partner up with you to have the best time possible. Focusing on creating a more stable environment helps your animals be calm, peaceful, happier and healthier during the holiday and will help you enjoy them more too. Â© Copyright Val Heart & Friends LLC. All Rights Reserved.Â Reprint rights by request only. Is your pet trying to talk to you? Learn how to talk to animals yourself! Start here with my free ebook: Hidden Secrets to Communicating With Pets. Yes I Want Your Free eBook! Disclaimer: Every effort has been made to accurately represent our product and it's potential. The testimonials and examples used are deemed to be typical results but are not intended to represent or guarantee that anyone will achieve the same or similar results. Each individual's success depends on his or her background, dedication, desire and motivation. The entire contents of this website are based upon the opinions of Val Heart, unless otherwise noted. Individual guest articles are based upon the opinions of the respective author, who retains copyright as marked. This information is not intended to replace a one-on-one relationship with a qualified pet health care professional and is not intended as medical advice. It is intended as a sharing of knowledge and information from the research and experience of Val Heart and her community. Val encourages you to make your own pet health care decisions based upon your research and in partnership with a qualified pet health care professional.